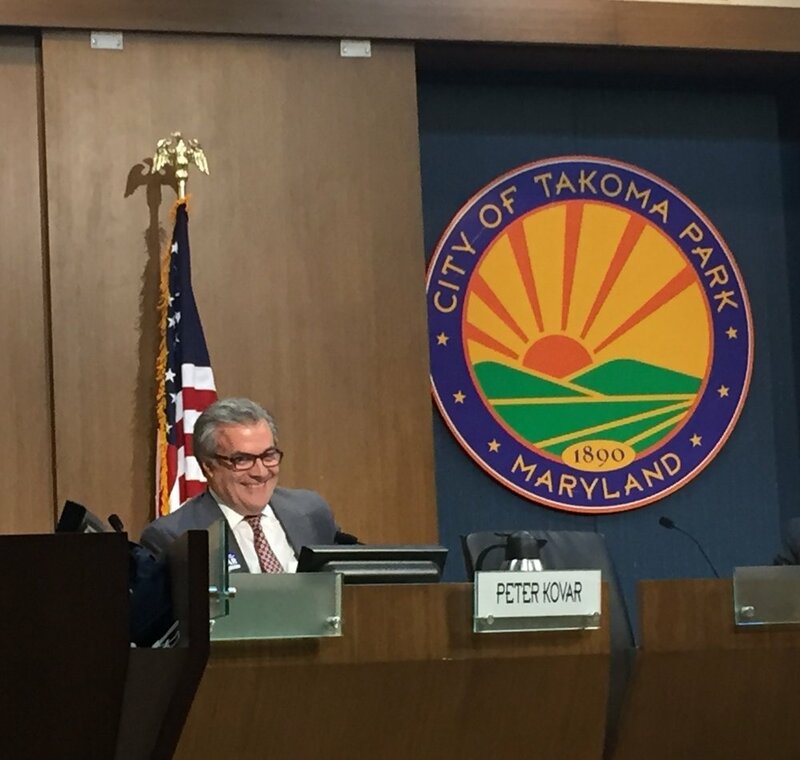 Here’s a link to the December 5, 2018 City Council meeting agenda: https://takomaparkmd.gov/meeting_agendas/city-council-meeting-agenda-wednesday-december-5-2018/. We’ll be starting out with a proclamation in honor of Dance Exchange’s 20th anniversary in Takoma Park. The meeting will focus on the small cell tower issue, with a public hearing on the proposed cell tower ordinance, a vote on a resolution outlining Council goals on the topic, and a first reading vote on the ordinance (with the final vote scheduled for January 9). Other votes will be on dedicating rents from the Takoma Junction project to our Affordable Housing Fund; design of Montgomery College’s Math-Science Building; State legislative priorities; and purchase of a Police Dispatch console. There will also be a single Consent Agenda vote, consisting of three separate items: the City’s Cultural Plan; setting the Council’s winter recess (this is the last Council meeting of the year); and appointment of the Youth Council Advisor. Finally, our work session will include discussions on commercial property tax options, and a minimum age for membership on resident committees. Public Hearing on Cell Tower Ordinance. The Council and City staff have been working on an ordinance responding to the recent Federal Communications Commission ruling that restricts the ability of municipalities to control within their own borders the installation of small cell towers. This public hearing, at which any member of the public can speak for up to three minutes, is an important opportunity for us to hear from the community about this issue. The hearing will be at the start of the meeting, right after the Dance Exchange proclamation. Cell Tower Ordinance: https://documents.takomaparkmd.gov/government/city-council/agendas/2018/council-20181205-3.pdf. The resolution and the ordinance are complementary. The resolution is a statement of the Council’s goals, and will serve as a valuable overall statement of what we want to accomplish as we take steps to regulate installation of small cell towers in our public rights of way. The ordinance will detail the process telecom companies will have to follow to apply for installation permits, and other ways we can exert control over installation. This comes on the heels of the FCC’s recent ruling that drastically curtails our authority over installation. With that ruling scheduled to formally take effect on January 14, it’s important that we have an ordinance in place by that date. This type of ordinance requires two Council votes, so our plan is to vote this week and then again on January 9 (our next Council meeting) to ensure we meet that deadline. Once we have some basic protections in place, we can adjust the ordinance based on new information or judicial and political developments. This is a complicated set of issues, and I’m reluctant to subject readers to an unduly long, technical write-up. So I’ll discuss here what I think are several of the most important points. For those who are focusing on this issue for the first time, the resolution offers a good summary of the main issues. Pre-emption. A series of FCC rulings, court cases and federal legislation have led to municipal authority over control telecommunications infrastructure being relatively limited. The small cell tower ruling is an especially egregious example. It shows again that conservatives are quite willing to abandon their supposed core principle that local governments are closest to the people and should be given broad deference in policy making. The truth is they’re happy to abandon the principle when it doesn’t achieve their corporate aims (as in this case) or when they find it a useful excuse to oppose national or statewide anti-discrimination legislation. And, there are examples now of conservatives at the State level pre-empting local anti-discrimination laws. In any case, the FCC ruling bars or heavily restricts localities from regulating small cell towers based on health or environmental concerns, aesthetics, the need for cell service improvements, etc. In our ordinance we’ve sought to go as far as we can in these and other areas, but our best chance of getting more flexibility may come about as a result of legal challenges to the ruling. We’ll also be fighting against likely efforts in the Maryland State Legislature to further restrict local governments’ ability to control tower installation. Health. The one health area municipalities have some room to maneuver on is the Radio Frequency (RF) emissions standard. While the standard hasn’t been updated in years, tower installers can be required to abide by it. I successfully pushed for adding language to our ordinance to require certification by an independent analyst that towers meet the current RF standard, that they’re checked periodically, and that any future updates to the standard must be met (by new towers and existing ones). We’ve been exploring other health related options, but haven’t identified any that appear to fit within the current legal framework. Montgomery County Zoning. The County handles zoning in the City, which means they set the rules governing tower installation on private property, including setbacks. Takoma Park has authority over installations in our public rights of way, but not on private property. The County Council was working on legislation to address some of those points in October, but they didn’t take a final vote. With a newly elected Council and County Executive, their timing isn’t clear. The City Council voted last week to write to the County asking them to work with us on these issues, and to address some of the setback concerns raised by City residents, including the potential for towers to be installed within 10 feet of multi-family apartment buildings. FCC Lawsuit. The City Council also decided last week to join a coalition of cities and towns that will be filing a lawsuit against the FCC ruling on pre-emption grounds. If this case or another produces a stay of the FCC ruling it’s possible the ruling could be temporarily stopped. If one of the legal challenges is successful, that would be much better news. But the legal process could take a couple of years and might be decided in the Supreme Court, which sadly has tended to defer to corporate interests of late, even before Judge Kavanaugh’s appointment. Next Steps. I hope we’ll approve the resolution and have an initial vote for the ordinance this week. Since there’s over a month before the final vote on January 9, we’ll be able to make further adjustments to the ordinance. I’ve spoken to and emailed with many residents about these issues, and I look forward to hearing from others during our public hearing. I’ve also consulted with a number of experts, communications lawyers, community activists, elected officials and staff from other cities, non-profit groups, and some industry folks. And I’ll be looking over the materials from last Friday night’s teach-in organized by City residents. I expect that this information gathering will continue, and that it might lead to further additions or changes to the ordinance. One of the big unknowns is the potential concentration of poles telecom companies would want to install in Takoma Park. Since intense pole concentrations tend to make more sense in heavily urban areas, it’s hard to predict what the companies may want to do here. This uncertainty is another reason we should have a good ordinance in place by mid-January. I’d be glad to talk with residents who have questions or concerns prior to Wednesday’s meeting, and I can also schedule meetings with individuals or groups in the period between this week’s meeting and the January 9 vote. Contact me via email to do that. Takoma Junction Rents: https://documents.takomaparkmd.gov/government/city-council/agendas/2018/council-20181205-4.pdf. The resolution approving the Takoma Junction development site plan included an amendment transferring rents paid by project developer NDC into the City’s Affordable Housing Fund. It was our expectation that, when the Council moved forward on our Housing Strategic Plan this fall, we would incorporate these rent monies into the Fund. Though we’ve made progress on the Plan, we still have more work to do in order to get it finalized. Meanwhile, rents from NDC are coming in, so it makes sense to capture those dollars now and deposit them in the Housing Fund. That’s the purpose of this legislation. Once we complete the Plan, we can determine specifically how the Junction monies will be used. Some residents have asked how we can avoid having these dollars simply displace other dollars in the Housing Fund. We won’t allow that to happen, but with details of the Strategic Plan still to be worked out, last week I offered an amendment stating our intent that the rent monies should supplement what’s in the Fund rather than displacing money that’s there. That amendment was approved, as was another offered by Councilmember Kostiuk to make it clear we’ll be discussing plans for the Fund as part of our broader discussion on the Strategic Plan. The final vote on the bill, which had been scheduled for last week, was postponed to this week to help make sure all these plans were fully explained. At this point, with the two amendments added, the bill is ready to go, and I’ll be supporting it enthusiastically at this week’s meeting. Montgomery College Resolution: https://documents.takomaparkmd.gov/government/city-council/agendas/2018/council-20181205-5.pdf. County officials will be reviewing the proposed design for MC’s new Math-Science Building through the Mandatory Referral process, after which the County may recommend design changes or other actions they want the College to take. With MC expected to submit its design to the County this month, the City can offer its views on the design through a resolution. The current version of the resolution, which I had substantial input into the drafting of -- addresses a number of important concerns the Council and many residents have raised about the project, and the importance of the building being compatible with the surrounding North Takoma neighborhood. I’m exploring the possibility of adding some additional language that would give the resolution added focus on the potential negative impacts the new building could have on the neighborhood. Legislative Priorities Resolution: https://documents.takomaparkmd.gov/government/city-council/agendas/2018/council-20181205-6.pdf. Every year before the Maryland State legislative session, the Council considers priority legislative areas we hope to work on with the Legislators who represent Takoma Park in Annapolis. Devising the priority list doesn’t prevent us from working on other matters that may arise, nor does it guarantee action on every item on the list. Indeed, it’s often the case that it can take a number of years to gain support for ideas of this type. For the coming year, certain items on the list may have a better chance to move forward than others, sometimes because of external forces over which we have no control or due to political developments that can’t be fully anticipated at this point. I fully support all the issues on our list, and I’ll be doing my best to push for action on them in Annapolis when the session starts in January. We’ll also have a public meeting in Council chambers on the evening of December 19 with our District 20 representatives (Senator Smith, and Delegates Moon, Wilkins and Charkoudian) to discuss our priorities and strategies for the coming session. The meeting starts at 7:30 PM, with a reception open to the public at 7:00 PM. Police Dispatch Console Purchase: https://documents.takomaparkmd.gov/government/city-council/agendas/2018/council-20181205-7.pdf. I support this purchase to enable the Police Department to upgrade its dispatch services. While the cost is somewhat higher than originally budgeted, the Department will forgo other technology upgrades to offset the higher price. CONSENT AGENDA -- I’ll be voting yes. Commercial Property Tax: https://documents.takomaparkmd.gov/government/city-council/agendas/2018/council-20181205-9.pdf. Due to concerns about the unfair way the inventory tax was imposed on City businesses, the Council earlier took action to eliminate the tax. While I supported that repeal, my preference rather than full repeal was to exempt a portion of businesses’ inventory from the tax. This would have exempted a high percentage of the City’s smallest businesses from the tax and given relief to the rest. We’ll explore whether there are other reasonable ways to replace at least some of the funds no longer coming in through the inventory tax. Since we repealed it out of concern for small businesses, a key priority for me in considering alternatives will be seeing that small businesses are treated as fairly as possible. Minimum Age for Resident Committees: https://documents.takomaparkmd.gov/government/city-council/agendas/2018/council-20181205-10.pdf. This will be an opportunity to discuss whether there should be a minimum age limit for people who are appointed to City committees, boards, commissions, etc. My inclination is to support a minimum age of 16, which is the minimum age for voting in local elections (though we’d need an exception for the Youth Council, which was set up with the idea that membership could go down to seventh grade). I don’t feel intensely about this, so I’m open to hearing other arguments about how we should proceed, including if we should even have a minimum age. Please feel free to be in touch with questions or comments on any of these matters.